Whenever I am in Berlin, I try to stop at the Rutz Weinbar in the Chaussee Strasse 8 in Berlin-Mitte and enjoy their outstanding wines. Rutz Weinbar is not only a top wine bar—it is also a top restaurant and a top wine store, but I go their for the wine bar. Rutz Weinbar has an extensive wine list, about 1000 or so wines, largely from Germany and other European countries. For example, Rutz offers 13 different wines from Weingut Kuenstler/Rheingau/Hochheim. The nice thing is that you can consume all wines for the wine-store- price plus a corkage fee of Euro 18. Winebar Rutz also has some excellent New World wines including about a dozen different vintages of Opus One. The oldest one—1985—goes for Euro 392 in the wine store, and Euro 410 at the wine bar. You can also eat at the bar from the exciting bar menu; I love the “Rinderroulade”—a German specialty. The kitchen and the main part of the restaurant, including an outside deck, are on the second floor. The restaurant is one of the best in Berlin, with 1 Michelin star and 16 Gault Millau points. Chef Marcus Mueller offers a number of 5/6 courses menus for between Euro 55 and 105; you can also eat a la carte for Euro 20 to 30 per course. Rutz Weinbar organizes special events on a regular basis. Next Friday, September 4, 2009, sommelier Billy Wagner has invited 6 prominent colleagues from all over Germany to participate in the “Hausbesetzung im Rutz”. This will certainly be a culinary feast and a lot of fun. Chef Marcus Mueller will prepare a 5 courses menu for Euro 139. Each course will be accompanied by a different—German-- wine, presented by one of the invited sommeliers. The Rheingau will be represented by a wine from Weingut Peter Jakob Kuehn/Oestrich. The dinner will be followed by a bottle party starting at half an hour to midnight. Unfortunately, I will not be able to make it as I will be in Berlin only a couple of weeks later. Then, of course, I will have my Rinderroulade at the bar, with the fantastic wines of the Weinbar Rutz. We had a wonderful wine. Apricot-yellow in the glass. Intense nose. A wave of honey and tropical flavors in the mouth, but a disappointingly short finish. Still, a over 30 years old bottle that has moved several times with us between the US and Europe. A great German wine from the Mosel. We cooked at home and drank two aged wines --- a French Chardonnay and a German Riesling. The Chardonnay was a 1991 Pouille-Fuisse from Leonard de Saint-Aubin. Pouilly-Fuissé is a sub-division of Macon in Burgundy. It produces wine of mixed quality, and as it doesn't have the three-tired classification system of grand cru, premier cru and village wine, you are more than ever dependent on the producer. Our wine was from the wine estate of Leonard de Saint-Aubin, which does not figure among the top wineries in the Macon. The 1991 Pouille-Fuisse turned out to be disapointing. It was over-aged, with a strong note of Sherry. Unfortunately, we waited much too long to drink this wine. But this was our fault. By contrast, the 1989 Avelsbacher Hammerstein (Mosel-Saar-Ruwer) Riesling Auslese from the Staatsweingut Trier was at its high-point. Typically, the Mosel Auslese wines, in particular those that you can find in the US, are stopped, low in alcohol and high in residual sugar. This Auslese was different. It was fully fermented to 11.5 % alcohol and bone-dry---just like the Pouille-Fuisse from further South in France. And despite all these years, still with an amazing amount of freshness, combined with a delicious hint of melon. I would guess the higher acidity level of the Riesling grape made all the difference in how these two aged wines presented themselves today. Both were wines in the $ 20 range, I guess. The Staatsweingut currently sells the 2005 Avelsbacher Hammerstein Riesling Auslese for $ 15 ex winery. There is a large variety of different types of German Rieslings. They can be dry or sweet and those that are sweet can be sweet for different reasons, reflecting factors before harvesting (the land) or reflecting factors during fermentation in the cellar (the hand). The purpose of this blog is to shed some light on these various factors. To start, some basics, which are often not well understood, but which are fundamental to the issue: The fermentation of grape must is a complex process in which sugars, naturally present in grape juice, are transformed into alcohol and carbon dioxide by the action of yeasts. The fermentation process stops when the alcohol level in the wine has reached around 13 to 15 percent of the volume. In most cases, all the sugar in the grape is fermented by then and the wine is dry. Thus, all over the world, even in the warmer regions, wine tends to be dry. The main role of sugar in the grapes is to produce alcohol in the wine. At the end of the fermentation, the sugar is gone, converted into alcohol. But Germany is also known for producing sweet non-dessert wines, ranging from simple and cheap party wines to rich and delicate sweet Spaetlese and Auslese wines. What makes these wines sweet is not the sugar content in the grapes (the land), but the skillful processing of the must by the winemaker in the cellar (the hand). Germany’s Spaetlese and Auslese wines, as well as lower quality wines, have a sugar content in the grapes at harvest that normally is fully fermented, even Spaetlese and Auslese wines. Yet, they are often sweet. First, stopping the fermentation; this is typically done through a skillful manipulation of the fermentation process with sulfur and temperature control. The winemaker needs to follow closely the fermenation process and must make sure that it comes to a stop at the desired level of sugar. Port wine, which is always sweet, is also made by stopping the fermentation process. But in the case of Port wine, what stops the fermentation process, is the adding of alcohol to the must and both the alcohol and sugar level in the finished wine become high. German wine makers can also add sugar to the grape must. And they do. This is called chaptalization in neighboring France and widespread there for the whole range of wines. But capitalization does not make the wine sweet. The purpose is to increase the alcohol level in the wine, not the sugar level. Winemakers in Germany are constrained by the law in terms of the quantity of sugar they can add and in terms of sugar content of the grapes. Only grape juice from grapes with a low sugar content can be enriched within certain limits with the purpose to bring the alcohol level to desired level. Thus, at the Kabinett, Spaetlese, Auslese, Beerenauslese, Trockenbeerenauslese and Eiswein levels, wines are not allowed to be chaptalized. But winemakers at times feel that chaptalisation would benefit a wines at the Kabinett or Spaetlese and they do it, but then have to declassify their wine. Again, those wines that are chaptalized tend to be dry, notwithstanding the sugar that was added; but it can be made sweet if the winemaker stops the fermentation or adds Suessreserve after fermentation.. I love the whole range of German white wines, in particular Rieslings, depending on the occasion. For foie gras, I get a ultra-sweet Riesling Trockenbeerenauslese; I like my veal breast with cream sauce and a bone-dry Auslese from Rheingau and Chinese Food with a sweet Auslese: and I serve a light, spritzy, off-dry Mosel Qualitaetswein at my summer parties. Winemaking in the US did not start in California. But California is the state everyone thinks of when talking about American wine. Yet, allmost all American states produce wine. And not only California produces fine wine. I am a big fan of wines from the Finger Lakes in New York State. Among others, they produce delicious Rieslings. I like in particular the wines of Hermann J. Wiemer and Dr. Konstantin Frank. But there are many other producers of outstanding wines. Dave McIntyre, the wine guru of the Washington Post, feels--and I agree very much with him--that the wines from Virginia, at the doorstep of Washington D.C., are under appreciated. To demonstrate that, he organized a blind tasting a few weeks ago. Indeed, the wines from Virginia did very well. Dave concluded: "we cannot ignore that wines produced within a two-hour drive of Washington stood toe-to-toe with highly touted competitors from California and France. This result is a snapshot of what six judges thought about two dozen wines one July afternoon, yet it should send a signal to retailers, sommeliers and consumers that local wines can match the best in the world -- and they are beginning to do so. It's time to put our preconceptions aside and focus on the quality of these wines". I cannot agree more. When I am in Frankfurt, I go to the wineries of the Rheingau, in Washington DC, I go to the Virginia wineries. The full Washington Post Article is here and Dave McIntyre's Blog is here. "Unplugged" by Eric Clapton has always been one of my favorite albums. Clapton recorded the album for the MTV unplugged series. This was a series of CDs recored live with as much authenticity as possible. Bone-dry German Riesling has always been one of my favorite wines. In the FAZ of August 16, 2009, Stuart Pigott writes about the bone-dry wines of Martin Tesch. One of those is his Riesling Unplugged. Martin Tesch is a young and ambitious winemaker from the Nahe region. He is one of the rising stars among Germany's new generation of winemakers. When he took over the family's winery a few years ago, he made the decision to focus exclusively on the production of dry wine. His goal was to return to the basics of authenticity, balance, and complexity. Towards that end, he created a wine that has become an international favorite: Riesling Unplugged. The wine is as natural as you can get, with tremendous value placed on environmental-friendly viticulture. The wine is untreated, meaning no must concentration or chaptalisation. Noilly Prat, the vermouth produced in Southern France near the loverly town of Sete, is an essential ingredient of the traditional Martini that is so much loved by Americans. The company Noilly Prat was created in the 1800s by a Frenchman and an Englishman, Mr. Louis Noilly (French) and Mr. Claudius Prat (British), who also had family ties, in Marseillan, where the business has remained to this very day, although the company was sold to an international vermouth producer some years ago. For many years, there were two versions of the dry Noilly Prat: an American version, sold exclusively in the US, and the original European version with a different flavor profile. While both versions are a blend of 20 herbs and spices that macerate in the base wine for three weeks, extended aging and the use of mistela and lemon liqueurs for sweetening produces more floral, fresher, herbal flavors and undertones of honey in the original (European) version --- for many years known only to those who had a Martini outside of the US, for example, at Harry'New York Bar in Paris or Newton in Berlin, or who brought a bottle over from Europe. Noilly Prat Dry Vermouth has a new bottle design. But Noilly Prat discontinued producing the special version for the American market recently. So, for the American consumer, it does not matter any more whether you have your Martini in New York or in Paris, but if you have it in New York it is no longer the same as it was for so many years. In carrying an article on the Martini in the issue of last Sunday, the New York Times reminded me of this development. What is still the same is that the main grape for making the Noilly Prat is the Picpoul de Pinet . This is a high yield grape that produces refreshing summer wines. Picpoul de Pinet is grown near the sea, just inland from the Bassin de Thau, south of Sete. The Picpoul is high in acidity, translating into freshness in the wine, which, when balanced by fruit flavours of lemon, apple or pear, provides a perfect partner to seafood, in particular the oysters farmed in the Bassin de Thau. I had an amazing Plateau de Fruits de Mer in one of the many restaurants at the harbor of Sete earlier this year only to find out that the lobsters on the Plateau de Fruits de Mer was imported from Maine. They do not have enough lobsters there and anyway cannot compete with the prices of the Maine lobsters, which have been falling quite a bit in recent years. The Picpoul de Pinet is widely available in the Washington D.C. area. I recently bought a case at Whole Foods for $7.99 the bottle. Great summer wine. A couple of weeks ago, my wife and I were in our Frankfurt am Main domicile and we had the pleasure to be able to attend a wine tasting of the Weinfreundeskreis Hochheim of which my wife and I are founding members. Also a founding member of the Weinfreundeskreis is Franz Kuenstler, the founder of the famous Weingut Kuenstler. He sits opposite to my wife in the second picture above. Hochheim is one of the top wine producing villages in the Rheingau region with about two dozens winemakers. Already Goethe spoke of its distinctive microclimate: '...among the magnates of Rheingau wine, Rüdesheim, Johannisberg and Hochheim, there can be no dispute about rank!...'. The Őchsle tend to be higher here than in other areas of the Rheingau. And it was the English Queen Victoria's (1819-1901) special preference for Hochheim wine that prompted the abbreviation ‘Hock' for all good Rhine wines. But Hochheim is perhaps best known in the U.S. through President Jefferson. This is where Thomas Jefferson, when he was Ambassador in Paris, visited in 1788 and brought vine cuttings back to America to plant in his own vineyard. Hochheim is about 50 minutes from Frankfurt Airport by S-Bahn. Most of Hochheim’s winemakers sell their wine directly to the consumer at their premise, which is typical for the German wine market, and many operate cosy Gutsausschänke (Restaurants), where you try their wines and eat hearty local food. The previous vintage, 2007, is an outstanding one. The April 30, 2009 issue of the Wine Spectator carries an in-depth review of that vintage. 2008 was an excellent year, but in terms of Őchsle, i.e. sugar content at harvest, 2008 did not match the previous year. In 2008, relatively cool autumn weather enabled grapes to ripen gradually and remain healthy. Crisp, lean Riesling wines with a fresh, fruity acidity are typical for the 2008 vintage. After cool weather in September, the Hochheim growers decided to wait until October before beginning with the harvest. For the most part, must weights reached 80 to 85 degrees Őchsle. As such, the 2008 vintage will be known particularly for high-quality Kabinett wines. It is a vintage which tends to be high in terms of acidity. The winemakers told us about their struggle with the high level of acidity, which they tried to contain through natural methods, such as leaving the grapes longer in the vineyard, and, if necessary, with chemical methods. The latter, however, has as a side effect, a foaming of the must, which can lead to a loss of aromas. The following winemakers were present. They are all typical German winemakers with 5 to 10 hectares of land only. All wine estates present were family-owned and family- operated wine estates, often covering three generations of the family. Weingut Dienst has a nice Gutsausschank, which is open throughout parts of the year. Weingut Hück sells about half of its wine in its Gutsausschank, where excellent, basic food is served. 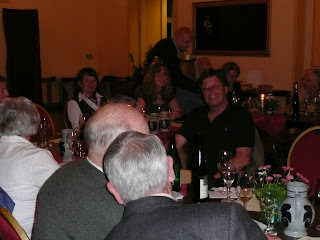 Weingut Rebenhof is known for its special, including cultural, events at the winery. The winemaker also stressed that the Rebenhof is one of the few wine estates in the Rheingau, that has a long tradition of biodynamic winemaking. We tasted 15 Rieslings, 3 from each winemaker, ranging from the Qualitätswein besonderer Anbautgebiete (QbA) category, where winemakers are allowed to add sugar to the must, to boost the alcohol level, to Spätlese wines, were chaptalisation is not allowed, but where winemakers can add Süssreserve (sterilyzed juice) to sweeten the wine. All the wines we drank had already been bottled. The presentation did not include any Auslese, Beerenauslese or Trockenbeerenauslese, as these wines still resting in the barrel. The large majority of the wines were dry wines, reflecting the large demand for dry wines in Germany, while the American consumer tends to prefer the sweeter wines, when it comes to German wines. 3. Hochheimer Daubhaus, Weingut Diefenhard. The fermentation stopped at a sugar level of 6.5 grams/liter. A cuvee from various individual vineyards, all belonging to the Daubhaus Grosslage (collective vineyard). Shows green apple and minerals. 6. Hochheimer Hofmeister, Weingut Hück. A bone-dry Spätlese, with a remaining sugar level of 3 grams/liter only. Shows grapefruit and mineral. 8. Hochheimer Kirchenstück, Weingut Schäfer Euro 9.50. A dry Spätlese, displaying an elegant interplay between delicate fruit and refreshing acidity. Hint of white peach. 11. Classic. Weingut Diefenhard. An off-dry-classic wine, with great character and a full nose. 15. Hochheimer Domdechany, Spätlese, Weingut Schäfer. A sweet Spätlese with 85 grams/liter of remaining sugar. Domdechany is Hochheim’s best vineyard. The nose was loaded with citrus and tropical fruits and the body was bold and round. Euro 9.00. There are basically two ways of producing wine that is in-between red and white wine and often called rosé wine. First, using red grapes, but limiting the skin contact of the juice during fermentation so that only a small part of the red color is extracted from the skin and the wine thus has a rosé color. Or, second, blending white and red grapes before fermentation or red and white wines after fermentation. Most of the rosés on the market these days are wines that are produced 100 percent out of red grapes. The wines do not become dark red because the fermentation procedure is such that only part of the red color is extracted from the skin of the grapes. Blending finished white and red wines is outlawed in many countries. On the other hand, blending white and red grapes before fermentation to make rosé-type wines is a specialty in a number of countries, including Germany. Interestingly, it is allowed for producing sparkling wines in France and many rosé champagnes and other sparkling wines are produced by blending finished wines. In Germany, there is a wine called ‘Schillerwein” that is produced by blending red and white grapes before fermentation. You can only find “Schillerwein” in the region of Württemberg in the south of Germany. Ideally, the red and white grapes are planted in mixed lots in the vineyards and are harvested and treated together. The name of the wine has nothing to do with the famous German poet Friedrich von Schiller (although he is from Württemberg). The wine got its name from the verb “schillern”. The verb "schillern" means "to scintillate". “Schillerwein” is thus a wine with a scintillating color, reflecting the fact that the wine is a blend of red and white grapes. In my wine cellar in McLean/Virginia I have a few bottles of “Schillerwein” in a 1 liter bottle produced by Weingut Dautel in Boennigheim/Württemberg. This is a simple refreshing summer wine with a taste slightly different from rosés made entirely out of red grapes reflecting the different fermentation process. You let the color come out fully, but at the end of the day the wine is not red, but rosé only, because of the blending with white grapes. More generally, the German wine law fully recognizes this kind of wine and distinguishes between 4 types of wine. (4) “Rotling”—a wine made by blending red and white grapes before fermentation; blending red and white wine after fermentation is illegal. “Rotling” wines produced in Württemberg are called “Schillerwein”.